SAN ANGELO, TX — Last Tuesday, April 24, was one of the scariest days ever for a family in San Angelo. The Copes Family were winding down for the day, when suddenly Joseph Copes heard his youngest child screaming from his room. He ran in the room to find his 10-year-old son, Scott, covered in blood from a deep cut that was from under his armpit to the center of his chest. “The amount of blood was crazy and I just knew that I had to put pressure on it to stop the bleeding or he would have bled out in minutes,” said Joseph Copes. The oldest daughter in the Copes family called 911, then dispatch operator alerted the ambulance crew of Medic 5 of the San Angelo Fire Department. The EMS crew received a report of an accidental injury in the 1900 block of Spring Creek Drive. In San Angelo, the Emergency Medical Services, or EMS crews are assigned to ambulance vehicles with the name “Medic” followed by the crew number lettered on their vehicles, hence the name “Medic 5.” EMS crews are operated by the San Angelo Fire Department and operate out of the public safety budget of the City of San Angelo’s general revenue fund. The ambulances operate to far-flung places out in the county as well as inside the city limits. They’ll go wherever they are needed to save lives. Not all ambulance runs are costing taxpayers cash. EMS services generate about $3 to 5 million per year in revenue for the City. According to Joseph, the glass window in Scott’s bedroom shattered somehow and the glass cut Scott deeply. From the time the call was placed into dispatch to the time the first responders delivered Scott to the emergency room at Shannon Medical Center’s Emergency Room was 12 minutes. On the crew for Medic 5 that night were Oscar Luz, Larry Russell, James Neeley, Chad Greaves, and Justin Strube. The medical training and expertise that these men so quickly implemented saved Scott’s life. 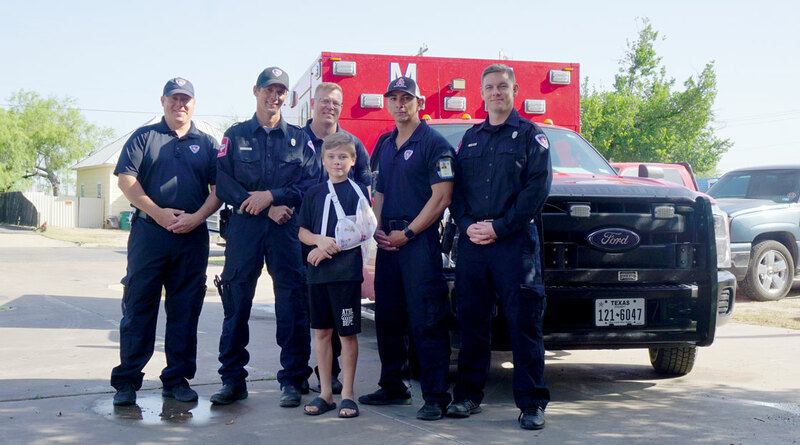 Scott is a 10-year-old fourth grader at Fannin Elementary School and is recovering fully. Scott mentioned his arm still being a little numb and he is going to be attending to six weeks of physical therapy. 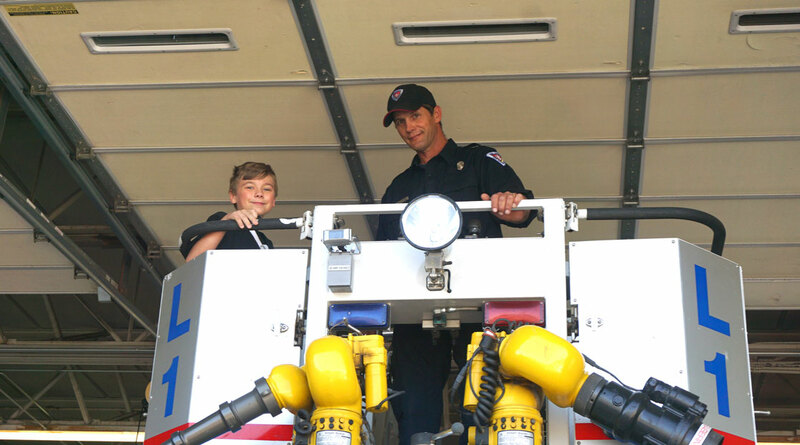 During the reunion Thursday at the Central Fire Station, Scott and Joseph got to personally thank the EMS crew that saved him. “We assumed Scott wouldn’t remember any of us because of everything that was going on,” said Oscar Luz. But Scott claims he remembers everything and thanked the whole crew for everything they did for him. Scott was moving around and climbing on the fire engine with ease. That was a sight everyone was happy to see. International Firefighters’ Day is Friday, May 4. The day is to show our appreciation for everything these brave men and women do to keep their communities safe. So, remember to show some love to your local fire stations tomorrow. Glad to see this story pop up. I have a relative who is a fireman in Angelo and I can assure you that first response teams out there don't always get to see a happy ending for many of the calls they get. This is a tough job field and it can be difficult to cope with some of the tragedies that these men and women have to deal with. Glad to see this boy re-united with the team that responded to the call! Kudos to our FIRST RESPONDERS ! ! ! Thank God that the right people were able to be in the right place at the right time to defy death and save this young man's life. Prayer for this tough guy and for our heroes who answered the call of duty to serve our community. I trust that every crew is equally qualified and ready to respond to any emergency circumstance presents. While this praise cites one team, it is the whole that must be included. Any of them willingly and professionally step up when called. And, prayers for Scott's complete, perfect, and rapid recovery and restoration.